Lucy is planning Little Ricky's fifth birthday party for Saturday, the same day that Caroline Appleby has arranged a birthday party for her son Stevie. Each affair has the same guest list and neither mother wants to change the day of her event. 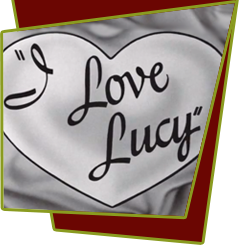 Caroline has hired a clown and magician, and even plans to stage a puppet show, hard acts for Lucy to top. Suddenly, however, Mrs. Ricardo remembers that Superman (George Reeves) is in town, and she asks Ricky to invite him to Little Ricky's party. Without waiting for a confirmation, Lucy phones Caroline Appleby and announces that Superman is coming to her party. Firmly defeated, Caroline cancels her party plans. When Ricky is unable to get the "Man of Steel," Lucy laments: "If I don't produce Superman, my name will be Supermud." She is left with no choice but to impersonate the hero. Donning a football helmet, ill-fitting tights, and a flowing cape, she climbs out on the ledge while Little Ricky's party is in full swing. When she is about to make her grand entrance through the living room window, who should show up but the "real" Superman, who makes a dashing leap into the room through the lowered windows of the kitchen. The party guests are thrilled, and so is Lucy but much to her chagrin, she finds she has been locked out on the ledge just when a rainstorm commences. Who comes to her rescue? Superman, of course, who comments to Ricky: "You mean to say that you've been married to her for fifteen years? And they call me Superman!" Special Notes: Technically, Little Ricky was only four, since he was born on January 19, 1953. Among Superman fans and collectors, this show remains a favorite. Prints, stills, and scripts from this episode command high prices. Special casters, available at the time only in Chicago, were used on the Ricardo piano to make it seem effortless for Superman to move the instrument. Credits for the show did not go to George Reeves for some reason, the credits carried the National Comics copyright for "Superman character, feats, and narration." George Reeves at first didn't want to do this episode unless he had his stunt man aide with him, and the director agreed. This is the last time we will see Caroline Appleby. Bloopers: When Carolyn and Lucy are arguing over which son was born closer to Saturday, Lucy says that Little Ricky was born at 11 AM. But in the episode "Lucy Goes to the Hospital" Little Ricky was born at night while Ricky was performing at the Tropicana.